The all-encompassing topic at HPA this year was “building bridges”. 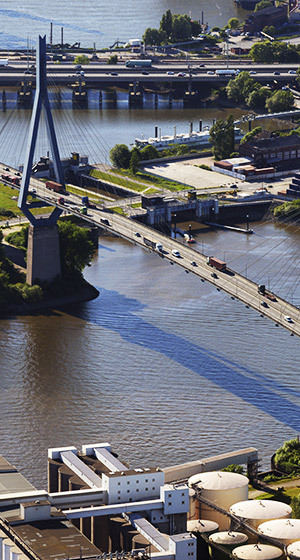 The construction of the new Kattwyk railroad bridge, preparations for the newbuild of the Veddel canal bridges and the development of pioneering ideas for the future Köhlbrand crossing began in 2018. 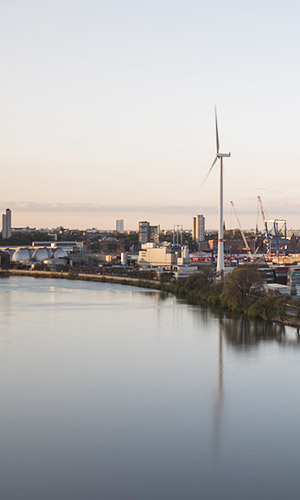 At the same time, we created the ideal connection for mega ships from all over the world to Hamburg with measures for fairway adjustment, which have already gotten underway, and are bridging the gap to the digital future with the testing of the new 5G communications standard. Of course, we will continue to invest our entire range of knowledge, our energy and dedication into these major infrastructure projects in 2019 and beyond – with the aim of ensuring that the Port of Hamburg remains as competitive and capable in the long term as it is today. Read what we are currently concerned with and what is giving us grounds to celebrate, apart from the holiday season. And if you are still looking for an idea on how to spend New Year’s Eve: the best view of the fireworks is from Steinwerder, directly next to the Old Elbtunnel, at Borsteinplatz overlooking the Michel, Landungsbrücken, Elbphilharmonie and harbour. I wish you and your loved ones happy holidays and a wonderful start to the new year. Within the scope of the two-year EU project “MoNArch”, HPA is testing the new 5G network technology in the port, in collaboration with Nokia and the German Telekom. The aim of this research project is to test the mobile connection architecture in real life and gain experience for the future. The innovative network concept not only offers high speeds, capacity and security, it is above all flexible. So-called network slicing enables separate virtual networks for various applications such as traffic signal control via mobile communication, the real-time transfer of measurement data, or augmented reality. In a first summary of the testing phase, the enormous potential of this intelligent new 5G technology, which is set to be rolled out across Europe in 2020, became apparent. The fairway adjustment of the Elbe is a major infrastructure project whose realisation requires a high degree of tact and foresight. 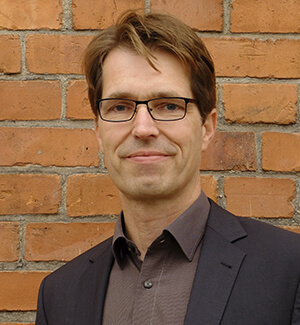 Marc Kindermann is one of the people responsible for the project, including the ecological compensation measures. He reveals in an interview the reason for his passion. The work on the fairway adjustment has commenced, which observant visitors in Köhlbrand can already notice. Here is where an important section is being expanded in order to bring the Elbe fairway up to the desired depth and breadth: the reinforcement of the riverbank in Köhlbrand Ost. 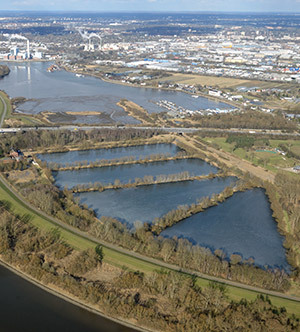 If the current access way to the container terminals were expanded with the current embankment, the incline to the riverbank would be too steep, as the Köhlbrand area is much narrower than other sections of the Elbe. For this reason, the fairway has been moved 15 metres to the east, to ensure that just one side of Köhlbrand must be secured. How this riverbank reinforcement is taking place in detail is explained by Marc Kindermann in an interview. Within the scope of the fairway adjustment, ecological compensation measures are essential to protect the flora and fauna. One of these measures is the relocation of the Schierlings-Wasserfenchel, which is only found along the tidal Elbe, to Billwerder Insel. Read more about the project here and this history-rich place. When the Köhlbrandbrücke was inaugurated in 1974, no one would have ever thought that the traffic would be as high as it is today, and thus the increase in strains the bridge would be succumbed to. When the first container ships came onto the scene, the transport of heavy goods particularly experienced a drastic boom. Today, around 38,000 vehicles cross over the bridge daily, and despite the extensive refurbishment in 2016, the ability of the bridge to remain in operation will end in 2030. A restriction on overtaking for trucks has already been in place since 2012. From 7 January 2019, HPA must take additional measures for protecting the bridge permanently – as a result, trucks in the area of the river bridge will have to maintain a distance of 50 metres from one another. The required signs for this will soon be installed. This distance rule will be in force until the necessary reinforcements of the steel bridge have been made. Talks of a tunnel or a new bridge are underway as a future replacement for the Köhlbrandbrücke. A decision is expected in 2019. 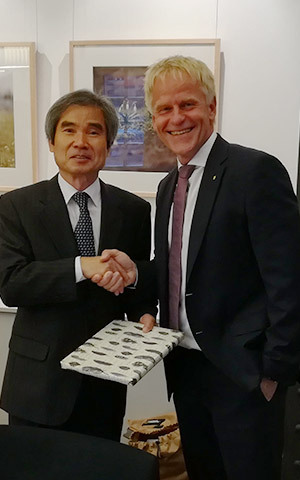 A true partnership: in November, Ki-chan Nam, the new CEO of the Busan Port Authority (BPA), visited Jens Meier, CEO of HPA, for the first time. Ki-chan Nam, who comes from the international university setting in South Korea, was previously a member of the BPA supervisory body. One of his first international journeys has now led him to HPA. On a tour of the harbour following his appointment with Jens Meier, HPA took the occasion to introduce Ki-chan Nam to the general conditions and development perspectives of the Port of Hamburg and, at the same time, to win him over for various collaboration models between HPA and BPA – including chainPORT, IAPH and international meetings. 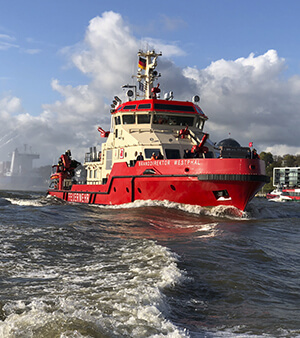 The new fireboat “Branddirektor Westphal” was christened on 26 November 2018. It sets new standards in port safety, boasting enlarged dimensions and modern equipment for fighting fires on vessels. 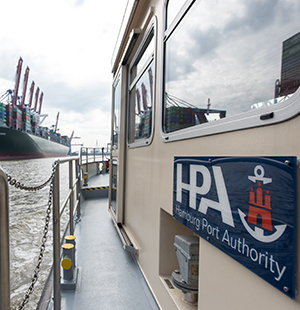 At the same time, it is a superb example of efficient management by the HPA subsidiary Flotte Hamburg GmbH & Co. KG. Let us introduce you! What a surprise! 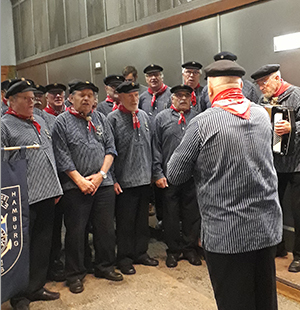 On St Nick Day, 6 December, pedestrians, car drivers and cyclists using the Old Elbtunnel enjoyed Christmas cheer from the visiting Windrose shanty choir. Experience the most memorable moments in our video. Perfect for the holiday season, the St. Katharinen church, located directly next to the Speicherstadt, is offering a wonderful music programme. On 22 December at 5 p.m., you can expect a Christmas choir and organ music concert; on 26 December at 11 a.m. cantata services; and on 31 December at 11 p.m. music to ring in the new year. If you want to get away from the hectic of Christmas, the Christmas market in the Überseee pedestrian zone in HafenCity is just right for you. Located a bit secluded from the hustle and bustle of the city centre, you can stroll from booth to booth as you please, enjoy delights and even go ice skating. The Old Elbtunnel was built more than 100 years ago and is just as part of Hamburg as the Michel church or the Elbphilharmonie. Following extensive restoration work on the east tunnel, the Elbtunnel will soon be shining in new splendour and as impressive as ever. You will be able to once again enter the east tunnel from the first half of the year.